L.A. Zonik.L is a very noble and modern young stallion, who was approved at the KWPN stallion licensing 2019. The expressive look, the nobleness and the very active hindlegs were some of the highlights of the licensing committee. The pedigree of the sire, Zonik, is with Zack, Romanov and Don Schufro a golden combination of bloodlines and a succesful product of Danish breeding. Zonik was successfully placed at the world championship for young horses and had his international Grand Prix debut in 2017 under Edward Gal. In 2018, he was placed eight in the World Cup final in Paris and at the WEG in Tryon he was individually placed as number seven and was placed number five with the dutch team. 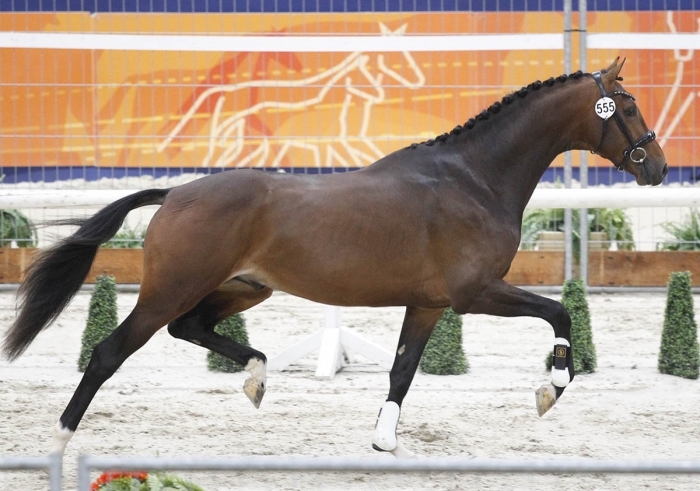 The grandsire is the dutch jumping stallion Goodtimes, who was the winner of his performance test as three-year-old. He sired more champion foals and mares and the approved stallion Lucky Times, who won the Pavo Cup as four and five-year-old and is successful in Grand Prix jumping. More of his offspring are very successful in Grand Prix jumping, but Goodtimes is often seen in dressage pedigrees to improve the canter. L.A. Zonik.L is approved in DW and KWPN. L.A. Zonik.L is not a carrier of WFFS.